The sound of the Gion Shōja bells echoes the impermanence of all things; the colour of the śāla flowers reveals the truth that the prosperous must decline. The proud do not endure, they are like a dream on a spring night; the mighty fall at last, they are as dust before the wind. Medieval epic The Tale of the Heike (Heike monogatari) has been called the Japanese Iliad, and it is not difficult to understand why. Certain parallels are irresistible: it is the story of an epoch-ending (and -making) war, a struggle for power between two rival twelfth-century clans - the Heike/Taira and the Genji/Minamoto - sketched upon a huge canvas with a cast of thousands. It is filled to the brim with ritual, codes of martial honour, supernatural artefacts, snapshots of single combat, and heroes falling through hubris. Even the authorship is complicated, à la Homer: the Heike is the multifaceted product of centuries of oral tradition, a storytelling industry so extensive that Heike-relators even formed their own guild in the fourteenth century. At the Hour of the Hare on the next day, the Twenty-Fourth, the two hundred thousand Genji horsemen bore down on the Fuji River with three battle cries, each mighty enough to make the heavens resound and the earth quiver. Yet I can't help but feel that - in tone and theme - it is closer to being a Japanese Aeneid. While there are intervals of warfare aplenty in the Heike, there is much more variety than in the (frankly somewhat monotonous) Iliad. As in the Aeneid, the Heike's storytelling focus lies equally - or more, even - upon the events and people of the margins. Put another way, both are epics that aren't afraid to weep. [H]e spent seven days and nights in a temporary shelter opposite the grave, chanting Buddha-invocations and copying sutras. On the last day, he put up a large stupa with an inscription: "May the holy spirit of the departed leave the realm of reincarnation and attain full enlightenment." [...] Even humble, untutored woodcutters wept into their sleeves at the sight, thinking, "There is no greater treasure than a child." For Naritsune himself, the years might come and the years might go, but never would he forget the loving kindness with which he had been reared. It all seemed a dream, a phantasm. Nothing remained but the endless flow of his yearning tears. "We must all follow the same path in the end. Even if a woman manages to lead a quiet, obscure life, something unexpected is likely to happen in a world where things seldom go as we wish. [...] When I doze, he visits my dreams; when I awaken, I see him in my mind's eye. I have decided it is better to sink beneath the waves than to live obsessed by longing." The overweeningly arrogant Heike are knocked from their pedestal of unjust power, and the brave new age of the Minamoto is ushered in - but the passing of the old, however necessary and preordained (the Heike are described at one point as "a clan whose karma-luck has run out"), is treated with a nostalgia bordering on the elegiac, in a way that reminds me of Virgil's treatment of FutureRome's enemies, allies, and obstacles (Dido, Camilla, Turnus...). Tomoe was especially beautiful, with white skin, long hair, and charming features. She was also a remarkably strong archer, and as a swordswoman she was a warrior worth a thousand, ready to confront a man or a god, mounted or on foot. She handled unbroken horses with superb skill; she rode unscathed down perilous descents. Whenever a battle was imminent, Yoshinaka sent her out as his first captain. "He must be over seventy. He ought to be white-headed; how is it that his hair and beard are black?" Lord Kiso said. Tears streamed from Kanemitsu's eyes. "Ah! Even on trivial occasions, a warrior ought to say things that others will remember later! Saitō always used to tell me, 'If I go into battle when I am past sixty, I will dye my hair and beard to make myself look young. It is childish, I know, to try to compete with the youths in the first place, but I don't want to suffer the humiliation of being dismissed as an old man.' Sure enough, he has dyed his hair. Have it washed and see for yourself." Lord Kiso had the hair washed, and it turned white. This customary warrior's concern - of immortality through glorious deeds (and death) in battle - finds a counterpoint in the story's pervasive undertone, alluded to in some of the quotes above. If there is one recurring theme, it is impermanence. All things pass and fade, whether flowers, men, or entire clans; everyone and everything has its time, and no more. Vignettes about drowning widows are accompanied by tangential tales of tragic lovers, of lifelong friends dying in battle side-by-side (the story of Yoshinaka and Imai is beautiful, but too long to quote here), and of individuals with nothing left to live taking the tonsure - an act that, for all its religious merit, is almost universally portrayed as a thing of sorrow, a withdrawal of youth and beauty from the world ahead of time. The Imperial Lady proceeded to the Jakkōin late in the Ninth Month of the first year of Bunji. Perhaps because the road led through mountains, the twilight shadows began to gather as she journeyed, her eyes lingering on the coloured foliage of the surrounding trees. A lonely sunset bell boomed from a temple in the fields, the thick dew on the wayside plants added fresh moisture to her tear-dampened sleeves, a violent wind sent leaves scurrying in every direction, and a suddne shower descended from the cloud-blackened sky, accompanied by the faint belling of a deer and the almost inaudible plaints of insect voices. The melancholy effect of so many depressing sights and sounds was quite beyond comparison. The emphemerality of worldly things is like springtime blossoms scattering in the breeze; the brevity of man's existence is like the autumn moon disappearing behind a cloud. [...] Once she had dwelt in a magnificent abode with jewelled towers, golden halls, and brocade cushions; now her brushwood hermitage drew tears even from the eyes of strangers. 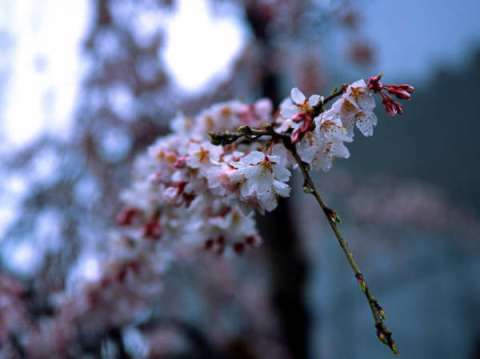 Shigenori, incidentally, possessed a fine eye for beauty and took special delight in the Yoshino cherry blossoms - so much so that he planted rows of flowering cherry trees in his grounds, constructed a building in their midst, and went to live there. Loath to see the flowers scattered after a mere seven days, he offered a petition to the Sun Goddess, and thereafter they stayed on the boughs for thrice seven days. The presence of a virtuous sovereign on the throne had inspired the goddess to display her powers; moreover, the flowers themselves possessed feelings. That is how they happened to last for twenty days. (Photo of actual Japanese cherry blossom courtesy of Alex). "I had always thought of the Heike as out of their depth in everything except warfare, but I stood and listened all night long while Shigehira played the lute and chanted. He is a man of the utmost cultivation," said Yoritomo. Poetry at this time, as I've discussed in relation to Chinese high society in a later era, was not so much a creative act (although they could be) as a necessary social skill. Clever poetic exchanges were indispensible to both male and female courtiers - particularly when it came to conducting liaisons. Contact between men and women was limited and highly ritualised; flirting and beyond took place beneath elaborate cloaks of secrecy (even though, to judge by surviving women's memoirs from the period, everyone indulged, and everyone knew). The skill of poetry-writing lay in wordplay - in inventive and beautiful use of customary form (set numbers of syllables) and imagery (sleeves are drenched in tears so often it's a wonder anyone had any dry clothes, frankly), as well as in playing off the imagery used by the partner in the poetic exchange. Showing one's breadth of reading through allusions to poems of yore was better still. of robes white as cresting waves. The Heike's fall marks the end of the Heian period - an end that had been signalled by their very rise to power, as a rural warrior clan stepping into the power vacuum left by an increasingly weak and faction-ridden Imperial court. By the poem's conclusion, a new form of political power holds the ascendancy, and a new, more martial, culture is on the horizon. The most typically Heian member of the clan, the grandson Koremori, is portrayed as a sentimental coward, drowning himself out of grief over separation from his family rather than meeting his obligations. But the Tale of the Heike provides fitting tribute. Mount Kōya stands two hundred leagues from the capital, remote from habitations and undisturbed by human voices. The treetops rustle in the mountain winds; peace shines in the rays of the setting sun. In the eight peaks and the eight valleys, the spirit can achieve true purity. Flowers bloom where mist touches the groves; handbells resound where clouds hang over the peaks. Ferns on tiles and moss on fences bears witness to the temple's antiquity.